For strawberries to stay fresh, do not wash them right away. Refrigerate them as soon as possible in the original clamshell or in a container with a dry paper towel at the bottom. Separate the berries by layering them with paper towels to maximize freshness. 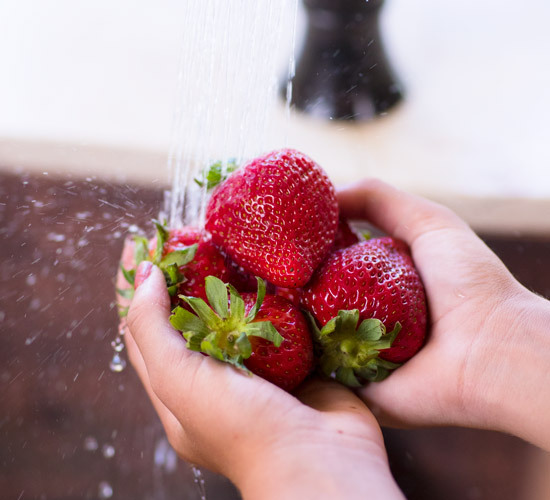 Just before using, wash strawberries with the caps attached under a gentle spray of cool water. Strawberries can also be frozen for future use. There are a few different ways to freeze strawberries. One popular method is to freeze whole without sugar to maintain shape and health benefits. After rinsing, gently blot dry and slice stem off at top of berry. Place cut side down on a cookie sheet lined with waxed paper and place uncovered in freezer for a minimum of six hours. Transfer strawberries to a freezer bag or container. Frozen strawberries can be stored frozen for several months.